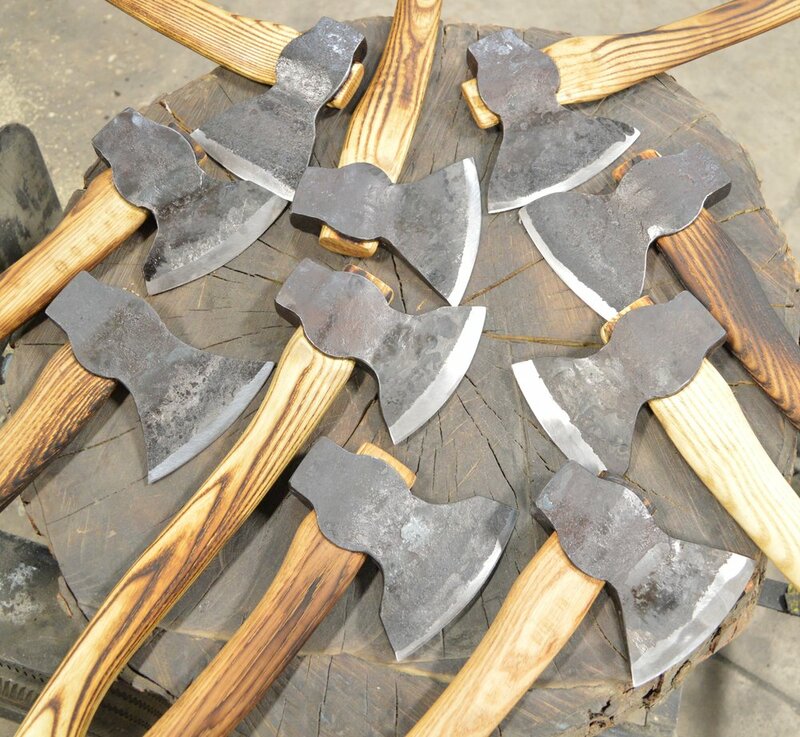 In this workshop you will use hand techniques to make a camp axe with a 1.5lb head and 14'' handle. The class will proceed as follows, with each step first being demonstrated. Taking the class with a buddy? Use the code "TSD" at checkout for a two student discount of $20 off when you buy two classes at the same time. *The code TSD is to be used once when ordering two or more spots at the same time. It does not apply when purchasing single spots. If used for a single spot the order will be canceled and refunded. *I can also host your private group on a custom date. start to finish. You'll want to set up your own forge after this." "A friend and I went down to make our own axes. We had a blast!" "My girlfriend booked me a spot after I had mentioned an interest in blacksmithing a few weeks prior. It was hard work but I walked away with my own axe, I love it." "In March 2017 I took an axe forging class with Toronto Blacksmith, Paul Krzyslowski. It was my first experience forging and from what I heard it was also one of Paul's first attempts teaching solo. I was greatly impressed. Not everyone who is good at doing is good at teaching. This was not the case with Paul. The material was broken up into manageable sections with clear direction. Even though the class was running longer than planned, Paul did not rush anyone or try to take away from the experience. Looking around when all was said and done everyone produced a functional and unique axe. I definitely plan to attend another class as well as add one of his axes to my collection." You led an excellent class and I enjoyed my time making my axe thoroughly. I will be back soon with my girlfriend's brother. Take Care!" "My name is Derek B. It's an experience that I can't wait to try again"
My new shop is located in St. Catharines, Ontario. The nearest intersection is Welland ave/Cushman rd, just off the QEW. There are many restaurants within walking distance of my shop located along Welland Ave. Bring plenty of water. At the workshop there is a washroom and toaster oven. Please wear non-synthetic clothing such as jeans and a cotton t-shirt. Leather boots, ideally steel toed, are preferred. Keep in mind you will be getting dirty, so it's best to bring old clothes. If you have any preferred personal protective equipment, you are welcomed to bring it to the class. I will also be supplying safety glasses, ear plugs, and gloves. You will be required to sign a waiver before beginning the class.